Stainless steel 1 1/2 bowl undermount sink. 100% Canadian Maple cutting board. Stainless steel grid (right bowl). ASA polymer translucent smoke grey drain tray. 400537 Stainless steel soap dispenser. 400694 Bronzed Cafe soap dispenser. 400695 Stone Biscuit soap dispenser. 402985 Stainless Steel soap dispenser. 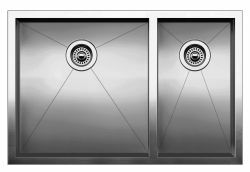 512336 SOLON drop-in stainless steel waste management system. 512472 SOLON undermount stainless steel waste management system. The SOLO-BOX chute can be used to direct waste to a receptacle below the counter or the optional 406299 can be added to collect waste. The chute from the 406300 fits inside the collar of the 406299 to ensure any refuse thrown down the chute is collected in the bin. 406250 Clip to undermount drop-in sinks. 407301 Undermount clip for Stainless Steel undermount sinks. 406252 Extension clip for thick countertops or any solid surface material 1 - 1 3/4" thick. To clean, polish and maintain the original luster of your sink, BLANCO has developed two special, non-abrasive cleaners. 406200 Coloured sink and surface cleaner 450 ml. 406201 Stainless steel cleaner 450 ml.